FCPX LUT: Film Noir is an all-new look-up table pack from Pixel Film Studios, allowing editors to quickly and easily add film-noir style color grades to their footage. A LUT is a Lookup Table that contains a mathematical formula for modifying an image and its color channels. The LUT changes every pixel's color to the corresponding color indicated by the look-up table. This pack comes with 60 film-inspired CUBE LUT files. 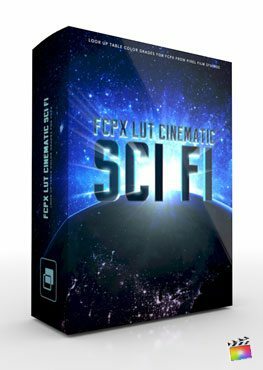 FCPX LUT Noir requires Final Cut Pro X 10.2.1 or newer. FCPX LUT Noir is inspired by the looks of Film-Noir. FCPX LUT Noir can instantly make give any footage a dark , iconic style. From black & white to contemporary high-contrast sepia tones and everything in between, with 60 different film color gradings to choose from, you can make your dark & dreary in the spirit of Film-Noir styled films. FCPX LUT Noir gives FCPX users the necessary tools to make each shot have its own Noir Style. With every selectable color grade built into one easy to use tool, FCPX users simply apply the effect to each clip, customize each channel to the desired look and export. CUBE LUT files are extremely versatile. They can be used in many different softwares. With the FCPX LUT Noir Loader from Pixel Film Studios, editors can quickly and easily load a LUT file directly into Final Cut Pro X to color correct or grade their footage without having to use another software. Users can simply drop the loader on top of their footage and then, use the drop down menu to select or import a CUBE file. FCPX editors can utilize the customization controls in the FCPX LUT Film Loader to adjust the strength, contrast, brightness and saturation of their image. They can also make further adjustments to color of the lights, darks, and mid-tones if they are unhappy with the look of the Preset settings, or want to adjust each shot to the desired effect. Where do I find FCPX LUT: Noir? Where is your tutorial for FCPX LUT: Noir? I installed the FCPX LUT: Noir and see a red screen similar to this. I installed the FCPX LUT: Noir and see a screen similar to this.